Fargo. No Country For Old Men. 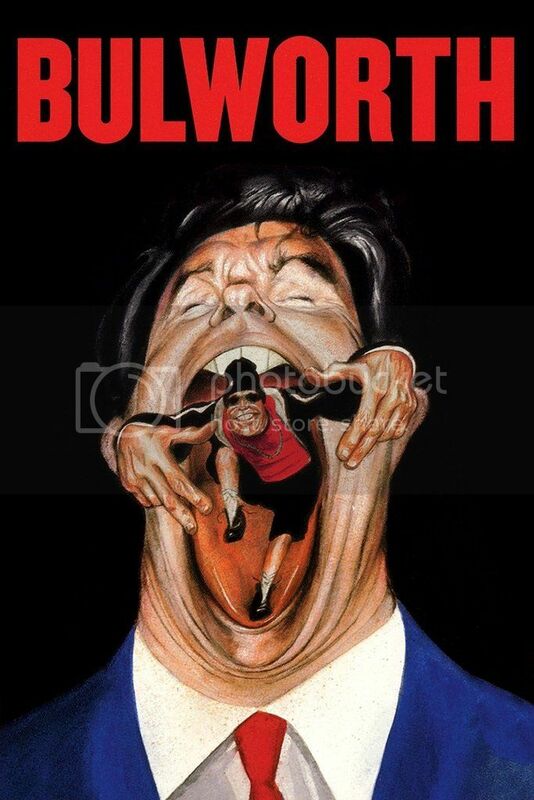 And also this film. Joel and Ethan Coen have made three genuine classics, and a handful of other great films as well. Is it possible they are still underrated? I think it’s possible. Last week Michael took Aaron on a transatlantic trip to show him Snakes on a Plane. This week Aaron takes Michael out from under the proverbial rock for The Big Lebowski. Aaron Hubbard: I was excited as hell when I knew I could pick this. Honestly, there aren’t many movies that fit the bill of “movies you want to share with your friends” more than The Big Lebowski. It’s a riot, it’s a trip, and there is nothing else like it. Michael Ornelas: So….yeah. Pretty much all that. I can’t believe I haven’t seen this before either, but I held off over a year once we put it on the calendar, even though I bought the steel book for this very occasion almost 8 months ago now. I very much enjoyed this delightful little movie! Aaron: This film is a master class in awkward comedy. The Coens are great at writing dialogue that suits the needs of their movie. The needs of this movie are to waste time and to make people laugh. The tone is set perfectly right from the start with Sam Elliot’s meandering introduction. But the scene that always sums up this movie to me is the first bowling scene. The Dude, Walter and Donny have some of the most authentic dialogue imaginable. You can sum up the point of the discussion in a sentence or two, but it takes them minutes just to get the conversation started. This continues throughout and eventually I find myself no longer caring. In the best way. I just want to hear the ridiculous things these characters say. Michael: You seem very focused on the idea that nothing matters and “wasting time” is a priority (even though I know you don’t mean that as a negative aspect). While the plot is a circle where the characters end up where they started, I don’t think the movie is full of things that fill time. We’re treated to an adventure throughout the course of the film, and I personally loved going on the journey. And unlike Hail, Caesar!, I didn’t feel ripped off when it went nowhere by the end of it. But the biggest laughs I got from the film were in the execution of the mishaps. Aaron: I think what I mean is that the plot is unimportant. The point of this movie is just to experience it, to enjoy the characters and their misadventures. There are half a dozen loose plot threads in this; from Bunny’s parents to the kid who stole the cash, to The Dude’s baby, and even the bowling tournament. Rather than finish a story, the Coens constantly add new stuff to it. Why? So we can laugh, have a good time, and be thankful for the experience. It’s almost a deconstruction of Film Noir; there isn’t a final solution, the bad guys aren’t always stopped, and not everything in life fits together neatly. Michael: There is not a weak character in The Big Lebowski. Everyone our characters encounter is memorable in some capacity. There are big choices made to add to their personality in memorable ways, and it makes the movie exponentially more interesting. From the two goons at the beginning peeing on The Dude’s rug, to Peter Stormare dropping a weasel in Jeff Bridges’ tub, to the producer of Log Jammin’ drawing a man with an erection before leaving the room…we remember something about everyone we see. 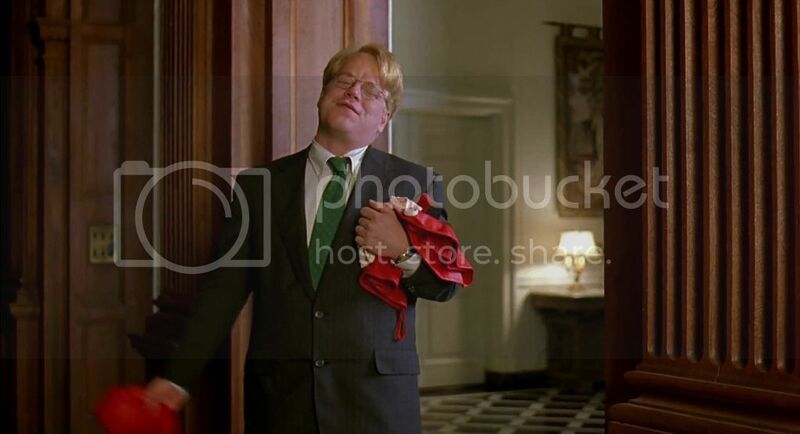 Philip Seymour Hoffman was the best of the bunch, making me laugh out loud with the subtlest of facial expressions. Aaron: It’s always funny for me to see him in here in such a small role; he really started to break out after this. I have to agree though; in many ways the film can be described as The Dude meeting people and reacting to their bizarre quirks. I love how even small bits like his landlord, the cop who throws the cup, and the taxi driver still stick out. This is the Coens at their best. And I think the best of the bunch is Goodman’s character. Walter is unforgettable. Michael: Oh yeah, of course Walter is the best — but I consider him more of a major player than a background character. He brought the conflict into the movie (I know technically the ransom is the conflict, but Walter is the element of chaos) and manages to escalate the stakes of every single scene he’s in, be it his inability to do anything on Saturday for religious reasons, the fact that he’s incredibly trigger-happy, or his disdain for pretty much everything. He and The Dude are a packaged deal in this film and no one brings up this movie without mentioning him. This movie is all about memorable characters, and Goodman takes the cake. 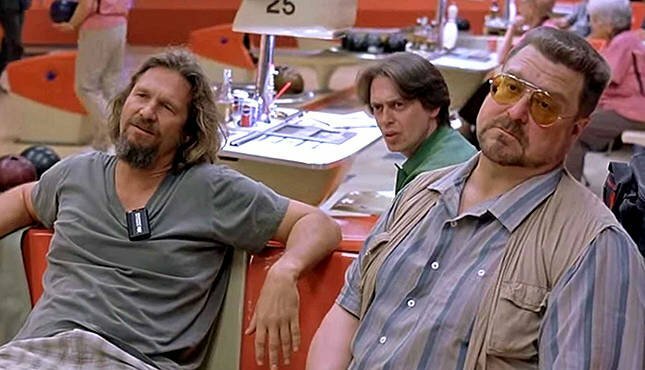 Aaron: Books have been written about the philosophy of The Big Lebowski and how it relates to different things, such as the Gulf War, masculinity and castration, and a half dozen other things. But I think what stands out most is The Dude, and how he interacts with the world. Which is to say, he sort of doesn’t. He’s content with what he has, floats around to do as he pleases, and never lets anything seriously bring him down. It’s a very odd way to go through life, but he isn’t harming anyone, so… is there anything wrong with it? Michael: I may actually say that of all the characters I’ve seen in movies that didn’t have an arc (or even a realization of destiny), The Dude is the one I enjoyed the most. He’s just a great presence who knows what he is. His lack of ambition and solid moral compass allows him to just kind of float. But of course when all you want is to float, you’ll have everyone around you making a splash in your pool, and you’ll be forced to adjust. It’s a fascinating study in characterization. And what’s weird is…I never thought “Well, so-and-so is the real main character of the movie anyways…” — it always felt like The Dude was who the story was about. It’s oddly enjoyable. Aaron: He would be the side character in any other movie, but he is the perfect voice for this film. And Jeff Bridges was amazing casting; I don’t know who else could have so effortlessly embodied the traits of The Dude. I firmly believe he’s one of the greatest characters of all time, maybe even the most iconic Coens character. Considering Marge Gunderson was also created by them, that is no small feat. Aaron: There is a lot more to this film, but honestly you should just read around to see other potential meanings. To me, the film is probably my favorite comedy (a genre I’ve never fully embraced), and the most fun you can have with it is with friends. What could I really change to improve this movie? Michael: This film was really easy to watch and it was just bell-to-bell fun. I wouldn’t really change anything about it, and all the performances were stellar. I hope they never make a sequel because there’s no way it could surpass this. Aaron: Well, that’s just like, your opinion. Man. Michael: I…I agreed with you? What do you want from me?? 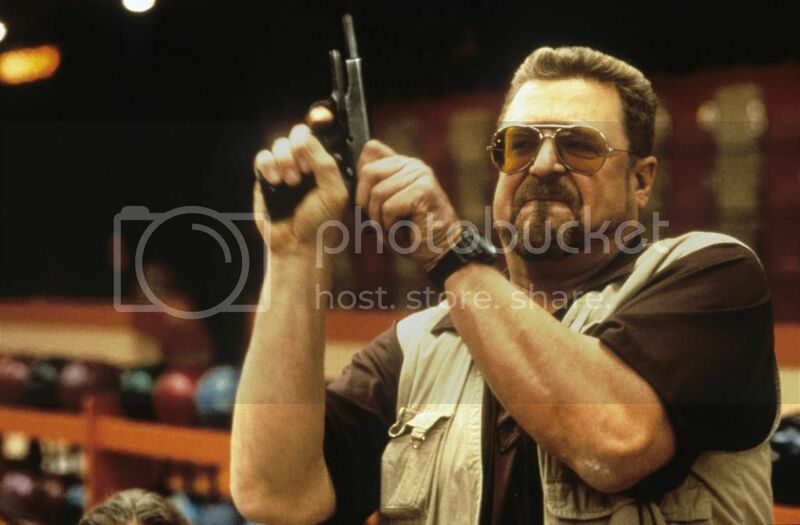 How have we not found some way to get John Goodman an Oscar by now? Michael: We’re about to inaugurate a new president here soon…so I wanted to go with a political movie that I think is an absolute blast. Aaron: I’m glad I can always rely on you for escapism. Michael: You’re going to love this though. Who’s your favorite rapping politician? Michael Did the Ghost Pepper Challenge! Supergirl takes center stage in 411 Comics Showcase, but I’ve also got a new movies column. Taken For Granted is a column that looks at movies that are generally accepted to be classics and examines why they are so good. This week, it debuts with Jurassic Park. 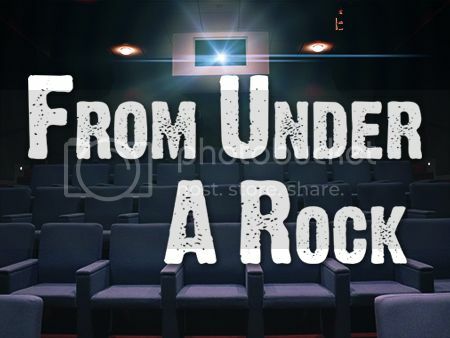 Check me out here to see my star ratings for around 680 films. Recent reviews include Superman II and III, Easy Rider, and La La Land . The Big Lebowski is kind of a masterpiece. 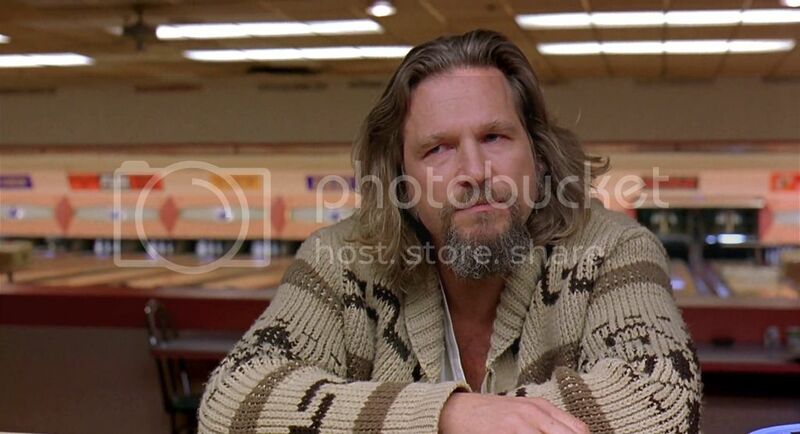 The Dude is one of the greatest characters of all time, and he meets a slew of other amazing characters. The dialogue is incredible, and while it's definitely a strange movie, it's an unforgettable one. The Dude abides.